Background Restenosis remains a problem in hemodialysis access interventions. Paclitaxel-coated balloons have shown promise in reducing access-related restenosis in small trials. The primary hypotheses for our multicenter trial were superior effectiveness at 180 days and noninferior safety at 30 days of a drug-coated balloon compared with conventional angioplasty for treatment of dysfunctional arteriovenous fistulas. Design, setting, participants, & measurements This randomized trial enrolled 285 patients with dysfunctional arteriovenous fistulas at 23 centers. Grafts, central venous stenoses, thrombosed fistulas, and immature fistulas were excluded. All patients received angioplasty of the lesion responsible for access dysfunction. After successful angioplasty (≤30% residual stenosis), lesions were treated with either a paclitaxel-coated balloon or an uncoated control balloon of similar design to the drug-coated balloon. Access function during follow-up was determined per centers’ usual protocols; reintervention was clinically driven. The primary efficacy outcome assessment was done at 6 months, and the safety assessment was done within 30 days of the procedure. Prespecified secondary end points included assessment of postintervention target lesion primary patency and access circuit primary patency at 6 months. Results The 180-day end point was not met with target lesion primary patency (71%±4% for the drug-coated balloon and 63%±4% for control; P=0.06), representing a difference of 8%±6% (95% confidence interval, −3% to 20%). Access circuit primary patency did not differ between groups. Interventions to maintain target lesion patency were fewer for the drug-coated balloon at 6 months (0.31 versus 0.44 per patient; P=0.03). The primary safety noninferiority end point was met and did not differ between groups (P=0.002). Conclusions Paclitaxel-coated balloon–assisted angioplasty did not meet the primary effectiveness end point at 180 days compared with conventional angioplasty. Both arms showed equivalent safety (ClinicalTrials.gov number NCT02440022). It has been 51 years since the original description of hemodialysis fistulas (1), and the superiority of fistulas over other forms of hemodialysis access remains widely accepted (2). However, failure of fistulas remains as pervasive a problem today as it was half a century ago. Access failure results in missed or inadequate treatments, hospitalization, and catheter use, costing the United States health care system approximately $2 billion annually (3). In spite of substantial advances in our understanding of the pathophysiology of access stenosis and restenosis, there have been no large-scale studies showing superiority of any intervention for treating fistula-related stenosis. Among the most promising candidates for preventing de novo stenosis or restenosis after intervention is paclitaxel, which has proven to be beneficial in preventing restenosis in large studies in other vascular beds (4–6) and several small, randomized, single-center studies in hemodialysis access (both grafts and fistulas) (7–11). These studies have used specialized angioplasty balloons that have the ability to deliver the drug to the vessel wall, where it is rapidly taken up and remains in the vessel wall. The purpose of this study was to investigate the hypothesis that paclitaxel-coated balloon treatment after successful angioplasty of stenosis in hemodialysis fistulas would improve outcomes compared with angioplasty alone. This multicenter (n=23), prospective, randomized, controlled trial was carried out under an investigational device exemption from the US Food and Drug Administration, and it was designed to test the safety and effectiveness of a drug-coated balloon in hemodialysis fistula–related venous stenosis. The study was carried out in full compliance with the Heath Insurance Portability and Accountability Act and the Declaration of Helsinki, and each site obtained Institutional Review Board approval for participation in the study; all patients signed informed consent. Inclusion and exclusion criteria are shown in detail in Supplemental Appendix 1. The primary inclusion criterion was a dysfunctional mature arteriovenous fistula (AVF) in the arm; thrombosed or immature AVF, central venous stenosis, and grafts were excluded. The Consolidated Standards of Reporting Trials (CONSORT) diagram (Figure 1) details patient selection and enrollment. To be considered for the study, patients had to have a nonthrombosed native AVF in the arm that had at least one clinical indicator of dysfunction as defined by the National Kidney Foundation’s Kidney Disease Outcomes Quality Initiative (KDOQI) (2). Consolidated Standards of Reporting Trials diagram for study accrual. *Not enrolled/not randomized. Patients who were candidates for the study underwent diagnostic fistulography to determine if they had a stenosis within the access circuit (defined as the anastomosis to the axillary vein inclusive) ≥50% with a matching clinical indicator (i.e., the lesion was such that the clinical indicator could be explained by the lesion) (2). After a patient was determined to have a matching lesion, other fistulographic criteria had to be met. Specifically, there could be no more than one additional (“nontarget”) lesion in the circuit that had to be successfully treated (≤30% residual stenosis) before randomization. Overall lesion length and configuration criteria also had to be met as shown in Supplemental Appendix 2. The target (study) lesion was then treated with high-pressure angioplasty with the requirements that the balloon waist be fully effaced and that there be ≤30% residual stenosis after angioplasty. Provided that these criteria were met, the patient was then randomly assigned to the drug-coated balloon group or control using sealed envelopes provided to the sites by study personnel. Randomization 1:1 was performed. Each site was provided with one set of randomization envelopes by the sponsor numbered in sequential order, with each envelope containing a treatment assignment card. The investigator was not allowed to open the randomization envelope (i.e., remain blinded to the treatment assignment) until after all successful predilation inflations were complete (when the last angioplasty balloon was deflated and the fistulogram confirmed success). To minimize bias, the subject, the nephrologist, and the dialysis staff were blinded to the treatment until after 1 year, the follow-up period required for all hypothesis-tested secondary end points to be collected. The investigator and members of the study team were of necessity aware of the randomization group, and therefore, they were not blinded (because the drug-coated and control balloons were visibly different). The study had both primary efficacy and primary safety end points. The primary efficacy end point was target lesion primary patency at 6 months defined as no need for clinically driven reintervention on the target lesion or access thrombosis (a complete list of definitions can be found in Supplemental Appendix 2). Of note, a patient could undergo reintervention on the AVF without target lesion primary patency ending provided that the reintervention did not include retreatment of the target lesion. This was tested using the hypothesis of superior efficacy of the drug-coated balloon over control. The primary safety end point was freedom from localized or systemic serious adverse events through 30 days that reasonably suggest the involvement of the arteriovenous access circuit as adjudicated by a blinded Clinical Events Committee. These would include life-threatening events or those resulting in death, requiring hospitalization, resulting in permanent disability, or requiring intervention to prevent permanent impairment; the latter definition included thrombosis. Secondary end points included hypothesis-driven (access circuit primary patency at 6 months) and descriptive ones (target lesion primary patency and access circuit primary patency at 3 months; device, procedural, and clinical success; access abandonment and number of interventions required to maintain access circuit primary patency at 3 and 6 months; number of interventions required to maintain target lesion primary patency at 3 and 6 months; device- and procedure-related safety events at 1, 3, and 6 months; and access circuit primary patency/target lesion primary patency using the 30-day window approach; i.e., at 210 days). 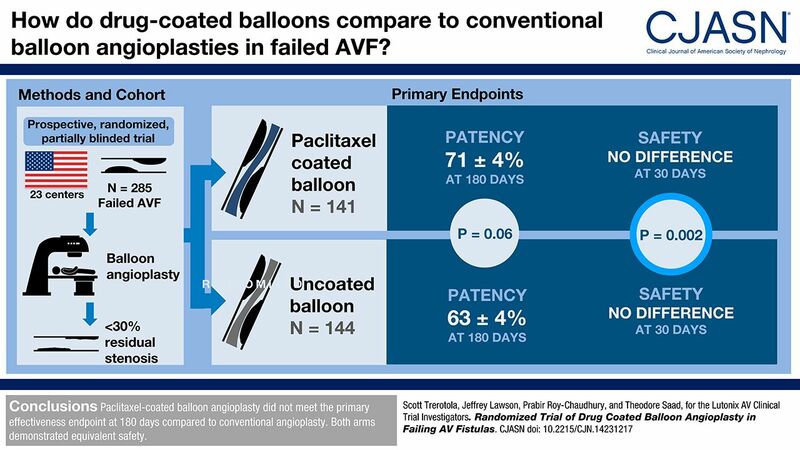 Of note, unlike target lesion primary patency, access circuit primary patency ended with any reintervention on the AVF, regardless of lesion location. The end points chosen for this study are consistent with the reporting standards of the Society of Interventional Radiology (12). Because the study is ongoing (enrollment was completed in March 2016; follow-up will end in March 2018), only end points and analyses up to 6 months are described herein. Similar end points and analyses will be applied at 9, 12, 18, and 24 months. Supplemental Appendices 1–4 have details of the device and procedure. In brief, the drug-coated balloon used in the study (Lutonix 035 DCB Catheter; Lutonix, Minneapolis, MN) is an angioplasty balloon with a 2-μg/mm2 paclitaxel-based coating. In contrast to the predilation balloon, the drug-coated balloon is a partially compliant low-pressure balloon. When determining percentage of stenosis for eligibility, stenosis was measured from the fistulogram images by determining the minimal luminal diameter of the stenosis and the diameter of the adjacent normal vessel (reference) and then applying the formula percentage of stenosis =[1−(minimal luminal diameter/reference)]×100. All fistulograms were analyzed by the Core Lab (Yale Cardiovascular Research Group, New Haven, CT) in a blinded fashion. Study and control balloon diameters were identical to that of the high-pressure predilation balloon. Drug-coated balloon length was selected, such that there was at least 5 mm extra length on either end compared with the predilation balloon; this was done to minimize “geographic miss.” The control balloon was of similar design to the study balloon. No postoperative anticoagulation or antiplatelet regimen was prescribed as part of the study, and investigators were permitted to prescribe any medications as part of their normal clinical practice. Follow-up assessments were conducted by telephone at intervals of 1, 3, and 6 months for the dialysis unit as well as the patient. Similar telephone assessments are planned at 9, 12, 18, and 24 months. In addition, an office visit with physical examination of the access was required at 6 months. All reinterventions were clinically driven; if the patient developed a clinical indicator of access dysfunction prompting reintervention, the details of that intervention were captured in an identical fashion as the index procedure. Investigators were asked to only treat the lesion(s) responsible for the abnormal clinical indicator during these visits in accordance with the National Kidney Foundation’s KDOQI Initiative guidelines (2). In addition to blinded Core Lab monitoring of all data points, independent Clinical Events Committee (CEC) adjudication and Data and Safety Monitoring Board (DSMB) review were carried out. The CEC and DSMB reviews were conducted in a blinded fashion. A detailed description of the sample size determination and statistical analysis can be found in Supplemental Appendix 3. In brief, intention-to-treat analyses were performed to evaluate target lesion primary patency and other end points. Kaplan–Meier analysis was used to estimate the target lesion primary patency rate in the drug-coated balloon and angioplasty groups. A log rank test comparing the drug-coated balloon with angioplasty was used to test the primary hypothesis to determine if the drug-coated balloon was superior to angioplasty. The test was successful if the one-sided P value was <0.03 and the result was in favor of the drug-coated balloon. The target lesion primary patency at 6 months was primarily assessed up to day 180, and it was assessed up to the end of the 6-month window (day 210) in an exploratory analysis The study protocol and statistical analysis plan described the 6-month visit as occurring at 180 days with a 30-day visit window, meaning that subjects could return for the 6-month assessment within the protocol-specified window from day 150 to day 210. The primary efficacy analysis involved Kaplan–Meier survival analysis of target lesion primary patency at 6 months. Because Kaplan–Meier requires assessment of survival as of a specific time point, a single point in time had to be chosen (rather than a window). Given that the analysis looked at 6-month survival, 180 days was used as the analysis point. The sample size calculation was on the basis of the primary efficacy end point of target lesion primary patency at 6 months, which was estimated as 70% in the drug-coated balloon group and 50% in the balloon angioplasty group. With a significance threshold of P=0.03 on a one-tailed test and 90% statistical power, the total sample size was calculated as 284 after adjusting for 10% attrition, with 142 in each treatment group. The 30-day safety end point was tested with a noninferiority approach using a binary approach (Farrington and Manning; 10% noninferiority margin). Secondary end points include access circuit primary patency, which was analyzed similar to target lesion primary patency, and the number of interventions required to maintain target lesion primary patency or access circuit primary patency, which was analyzed using a Wilcoxon rank sum test. Subgroup analyses and covariate analyses were performed to evaluate the influence of potential confounding factors. The study, performed under an approved US Food and Drug Administration Investigative Device Exemption, enrolled 285 (141 drug-coated balloon and 144 control) subjects at 23 centers between June 2015 and March 2016. Participating sites included hospital-based and free-standing practices, with investigators representing interventional nephrology (n=10; 44%), interventional radiology (n=9; 39%), and vascular surgery (n=4; 17%) backgrounds. Demographic data are shown in Table 1, and procedural details are shown in Table 2. As can be seen from the CONSORT diagram (Figure 1), of 581 patients screened, 489 met initial screening criteria and proceeded to fistulography, 175 were excluded on the basis of fistulographic findings, and 29 (9% of those undergoing angioplasty) were excluded on the basis of unsuccessful predilation. The primary effectiveness end point, superior target lesion primary patency evaluated at 6 months, was not met: Kaplan–Meier survival analysis at day 180 was 71%±4% (95% confidence interval [95% CI], 63% to 78%) for the drug-coated balloon and 63%±4% (95% CI, 54% to 70%) for control angioplasty, representing an absolute difference of 8%±6% (95% CI, −3% to 20%; P=0.06) (Figure 2). An exploratory analysis of effectiveness applying a 30-day window to the 6-month end point to minimize missing data points due to patients not completing their 6-month visit by 180 days (i.e., 210 days) showed statistical significance; target lesion primary patency was superior for the drug-coated balloon (64%±4%; 95% CI, 55% to 72%) versus control (53%±4%; 95% CI, 44% to 61%; P=0.02). This represented an absolute difference of 12%±6% (95% CI, 0% to 23%). 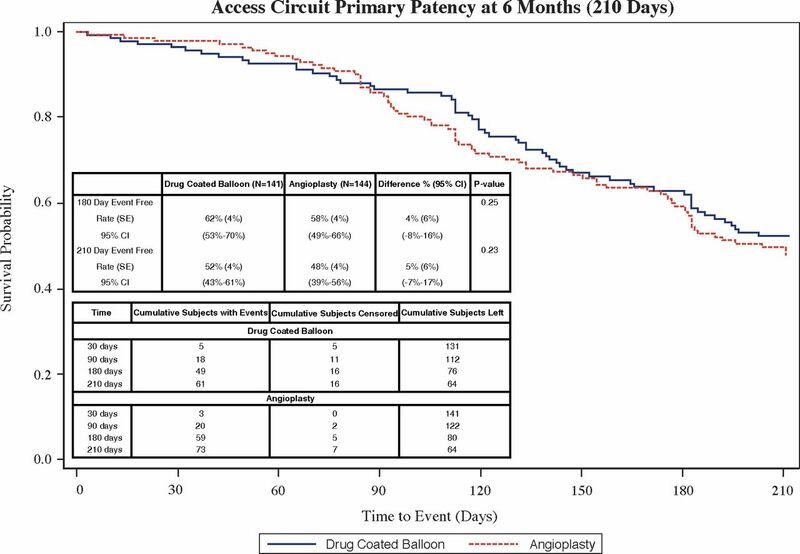 Six-month access circuit primary patency did not differ between the drug-coated balloon (62%±4%; 95% CI, 53% to 70%) and control (58%±4%; 95% CI, 49% to 66%; P=0.25) (Figure 3). Six-month access circuit primary patency also did not differ in the exploratory 210-day analysis. Interventions to maintain target lesion patency were fewer for the drug-coated balloon at 6 months (0.31 versus 0.44 per patient; P=0.03). Most reintervention was performed for recurrence of access dysfunction; thrombosis was uncommon at 6 months (2.4% in the drug-coated balloon arm and 4.3% in the control arm). 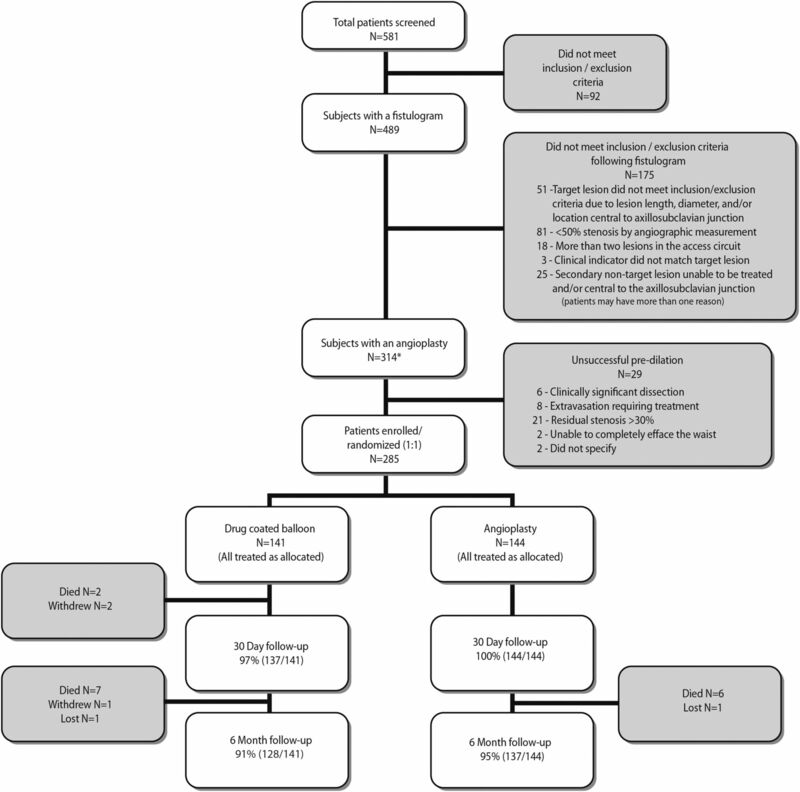 Anticoagulant and antiplatelet medication use during the study is shown in Table 3. Survival curves for target lesion primary patency show no significant difference at 180 days, but a significant improvement in patency for the DCB at 210 days (exploratory analysis). 95% CI, 95% confidence interval; SE, SEM. Survival curves for access circuit primary patency show no difference between DCB and control. 95% CI, 95% confidence interval; SE, SEM. As shown in Table 2, there were no differences in demographics, access characteristics, or indications as determined by exploratory analyses. Results were evaluated by site; a test for a site-treatment interaction was performed, and it was not significant (P=0.71; Cox). Hence, there was no evidence that an investigator effect was associated with differential treatment group responses. Likewise, Cox regression analysis did not reveal any evidence of treatment-factor interactions, including the procedural variables shown in Table 2. The primary safety end point for noninferiority for the drug-coated balloon versus angioplasty was met with one-sided P value of P=0.002 (Figure 4). 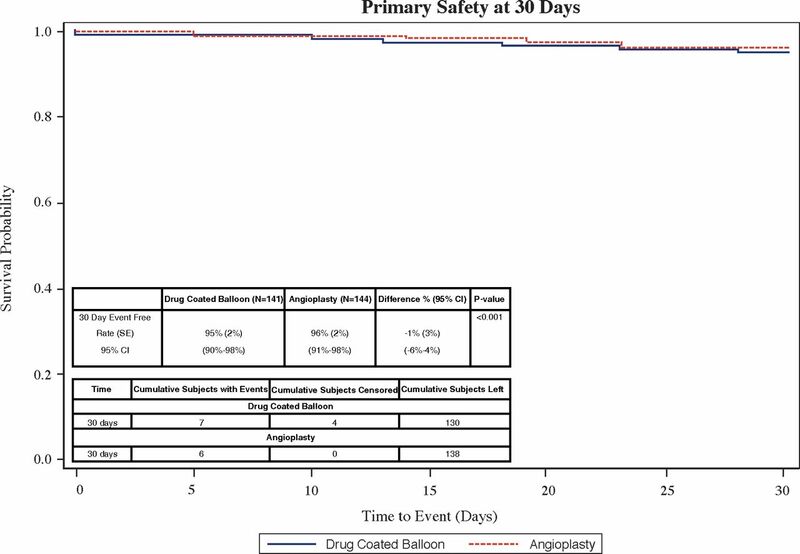 The result of the primary safety end point by binary analysis at day 30 was 95% (130 of 137) for the drug-coated balloon and 96% (138 of 144) for angioplasty. Survival curves for safety show no difference between DCB and control, meeting the non-inferiority endpoint. Note that the P value is for the Kaplan–Meier analysis and is not for the primary safety analysis, which was binary and P=0.002. 95% CI, 95% confidence interval; SE, SEM. The consequences of fistula failure to a patient relying on hemodialysis are substantial: missed or inadequate dialysis treatments, avoidable hospitalization, and catheter use all adversely affect quality of life and contribute substantially to health care costs (13). A variety of treatments for stenosis in fistulas have been introduced in the half century since the original description of the fistula (1), including percutaneous transluminal angioplasty, cutting balloons, stents, and stent grafts. Although some of these therapies have shown promise, to date, no treatment modality for fistulas has been shown in a large, multicenter trial to be any better than conventional angioplasty. This study builds on smaller, randomized, single-center studies that showed benefit of the drug-coated balloon over angioplasty (7–11). According to the specified 180-day primary effectiveness end point, this study failed to show superiority of a paclitaxel-coated balloon over standard balloon angioplasty when applied after successful angioplasty of stenosis in fistulas. However, applying a commonly used 6-month end point definition in an exploratory analysis, namely a 30-day window surrounding 180 days, did show a statistically significant benefit. The failure to meet the primary end point relates in large part to the decision to use a single time point (i.e., 180 days) instead of a 30-day window. Because subjects were permitted to return for the 6-month time point through day 210, this inadvertently eliminated relevant 6-month data. In the case of this study, the choice of the 180-day cutoff resulted in an undesirable censoring of subject data between 180 and 210 days. Per the protocol, all of these data were to be considered 6-month data. Thus, after study completion, the planned Kaplan–Meier analysis was updated in an exploratory analysis to adjust the analysis time point to day 210, such that all 6-month data would be included. Also worthy of note is that the 6-month observed patency exceeded the KDOQI recommendations in both groups. 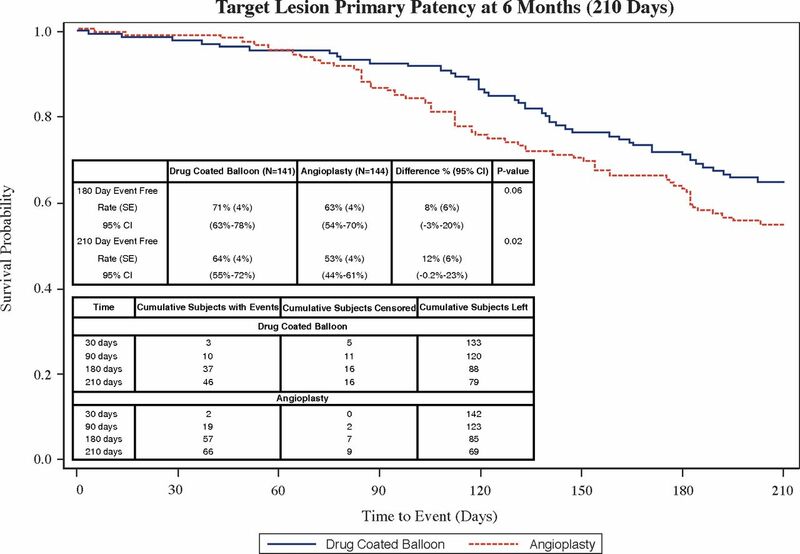 Furthermore, although the effect size is smaller than that seen in some prior trials, the 6-month target lesion primary patency in the drug-coated balloon group is very similar to that reported by Katsanos et al. (8) and Kitrou et al. (10), whereas the control arm patency was much lower in those studies (hence, the larger effect size). In those studies, the drug-coated balloon (which is a lower-pressure device) was used first, with further high-pressure angioplasty performed if the balloon waist was not effaced. It is possible that this study protocol, designed to maximize the pretreatment angioplasty result by using high-pressure angioplasty for the pretreatment, is biased in favor of the control arm, because more angioplasty was performed in that group than is usually done (two separate treatments; to control the variable necessitated by the drug application) and because the investigators were held to a very high standard of angioplasty result in both arms of the study. This is but one of many possibilities that deserve further study as more research is done on the role of drug-coated balloons in AVF interventions. The study is ongoing, and it remains to be seen whether the clear separation of the survival curves will continue through the 24-month study period. Although the drug-coated balloon arm showed probable benefit over angioplasty in terms of target lesion primary patency, access circuit primary patency did not differ between groups. This is not unexpected given the multifocal nature of stenosis and restenosis in hemodialysis fistulas. These data suggest that, to achieve improved access circuit primary patency, the drug-coated balloon may need to be used to treat all lesions in a given circuit. Subgroup analysis was unable to identify any specific lesion location where the drug-coated balloon performed better than the overall results, likely due to small sample size in such subset populations. The primary safety outcome was met in this study, indicating that paclitaxel in the dosage and delivery method used shows a lack of toxicity. The safety of the paclitaxel-coated balloon has been established in other applications as well as this one, and it is thus not surprising, but nonetheless reassuring (in the setting of uremia, oxidative stress, and inflammation), that the safety goal of the study was met here as well. Although there is no reason to believe that late complications will occur related to the drug-coated balloon, the completed 2-year data will hopefully confirm the 6-month data. Unlike some other applications, such as arterial disease, it is possible that relatively frequent use of the drug-coated balloon will occur in hemodialysis access, because restenosis is much more aggressive in this setting compared with arterial disease. Nonetheless, in the small doses used, even repeated use of the drug-coated balloon is highly unlikely to result in long-term adverse events. Although this was a relatively all-inclusive study, certain lesions and clinical scenarios seen in fistulas were excluded, including immature fistulas, thrombosed fistulas, and central venous stenosis. The approach taken in the control group, namely two separate angioplasty treatments, differs from conventional angioplasty, but it was necessary to minimize variables between groups. This might have affected the results seen in the control group as noted above. Having a single drug-coated balloon treatment instead of high-pressure angioplasty followed by the drug-coated balloon would be desirable; however, this drug-coated balloon is not a high-pressure balloon, and high pressures are frequently needed to efface the balloon waist in fistulas as shown in this study (30% of stenoses required >25 atm to efface the waist). Future trials will be needed to determine if the observed benefit with the drug-coated balloon applies to these situations as well. Fistula flow measurement would have been the most objective and standardized clinical monitoring parameter; however, because flow measurement was not available in all centers, it was not required in this study. Although the use of the blinded Core Lab strengthens the observations and measurements, there is likely to have been variability in the quality of the angioplasty and/or drug delivery among investigators. Ideally, the study would have been double blinded; however, as noted above, the trial device has a different appearance from a standard angioplasty balloon, and thus, blinding the investigator performing the index procedure was not possible. However, it is believed that this was substantially mitigated by blinding the patient and dialysis center to the treatment performed. In this randomized trial, a paclitaxel-coated balloon used after successful angioplasty in AVF stenosis was not shown to be superior to a standard balloon using a strict 180-day definition of the 6-month end point. Fewer interventions were needed in the drug-coated balloon group to maintain target lesion patency. The drug-coated balloon was as safe as the standard balloon. S.O.T. is a consultant for Bard Peripheral Vascular, Lutonix, B. Braun, Cook, Medcomp, W.L. Gore, Orbimed, and Teleflex. He receives royalties from Teleflex and Cook. J.L. is a consultant for Bard Peripheral Vascular; J.L. is employed by and has stock options in Humacyte and has ownership and stock in InnAVasc. P.R.-C. is a consultant for Lutonix, W.L. Gore, TVA, Medtronic, and Akebia and the founder and Chief Scientific Officer for Inovasc. T.F.S. is a consultant for Bard Peripheral Vascular. This study was sponsored by Lutonix. The investigators of the Lutonix AV Clinical Trial are Saravanan Balamuthusamy (Tarrant Vascular Clinic, Fort Worth, TX), Umar Waheed (Southwest Vascular Center, Phoenix, AZ), George Lipkowitz (Western New England Renal and Transplant Associates, Springfield, MA), Jeffrey Hoggard (Capital Nephrology Associates, Raleigh, NC), David Peeler (University Vascular Access, Memphis, TN), Roxana Neyra (Arizona Kidney Disease & Hypertension Centers, Phoenix, AZ), Michael Lawless (Life Access Center/St. John, Tulsa, OK), Jonah Licht (Providence Interventional Associates, Providence, RI), Angelo Makris (Chicago Access Care, Chicago, IL), Matthew Schaefer (San Antonio Kidney Disease Center, San Antonio, TX), Robert Molnar (Michigan Vascular Access, Flint, MI), Ari Kramer (Spartanburg Regional Hospital, Spartanburg, SC), Micah Chan (University of Wisconsin, Madison, WI), Greg Nadolski (Hospital of the University of Pennsylvania, Philadelphia, PA), Naveen Atray (Capital Nephrology Medical Group, Sacramento, CA), Charles Bratton (Medical University of South Carolina, Charleston, SC), Timothy Pflederer (Renal Care Associates, Peoria, IL), Ahmed Kamel (University of Alabama at Birmingham, Birmingham, AL), Scott Schultz (Minnesota Vascular Surgery Center, Minneapolis, MN), Luke Wilkins (University of Virginia, Charlottesville, VA), Zubin Irani (Massachusetts General Hospital, Boston, MA), Jordan Tasse (Rush University, Chicago, IL), William DaVanzo (Phoebe Putney Memorial Hospital, St. Simons Island, GA), Scott Resnick (Northwestern University, Chicago, IL), and John Ross (Access Connections, Bamberg, SC). See related editorial, “Drug-Coated Balloon Angioplasty for Hemodialysis Fistula Maintenance,” on pages 1140–1141. This article contains supplemental material online at http://cjasn.asnjournals.org/lookup/suppl/doi:10.2215/CJN.14231217/-/DCSupplemental.